We’ll be waiting for you in beautiful Cabo San Lucas! Every year thousands of fishermen across the globe flock to Cabo San Lucas to enjoy some of the best big game sportfishing in the world. If you’re thinking about making a trip to the area, Guerita Sportfishing can provide you with several deep sea fishing charters and make sure you have the time of your life. 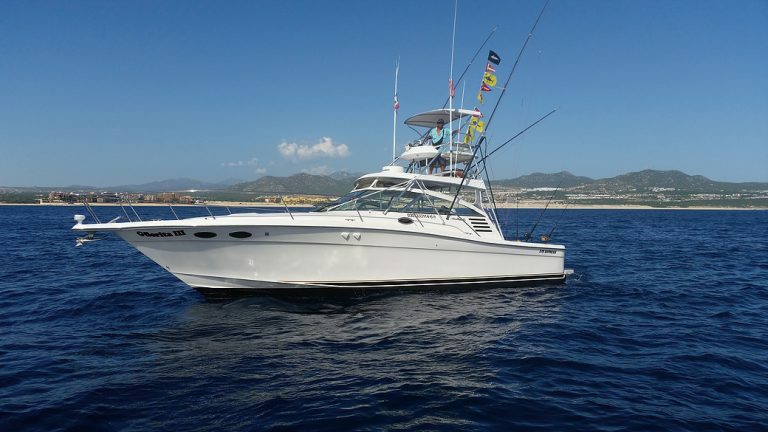 The crew at Guerita Sportfishing is well experienced in tournament fishing for marlin and tuna in Cabo San Lucas and has enjoyed a lot of success over the years. Guerita Sportfishing can set you up with a number of different Cabo San Lucas deep sea fishing charters during your stay in Mexico. Whether you want to fish for dorado, tuna, wahoo, sailfish, or marlin, Guerita Sportfishing has you covered. The English-speaking crew on Güerita III is very reliable and will make sure you get out on either the Sea of Cortez or the Pacific side of Los Cabos each morning in time to get a prime position on the water. But you, the client, must do your part to arrive on time for your scheduled charter. Guerita Sportfishing can offer you more than just Cabo San Lucas deep sea fishing charters. You can also take a site seeing cruise aboard Güerita III to see all the natural beauty in and around Cabo San Lucas. Additionally, Guerita Sportfishing offers whale watching cruises and sunset cruises that are perfect for those momentous occasions such as honeymoons, anniversaries and birthdays. You’ll have a great time on the boat whether you’re fishing or just cruising around and checking out the scenery. Regardless of which charter company you book a trip with during your stay in Cabo San Lucas, you should steer clear of “coyotes” on the docks who rent boats. You should only deal with reputable companies like Guerita Sportfishing – we will deliver top-notch service allowing you to have wonderful memories to take back home with you.